Hello Friends, it’s so good to have you back. 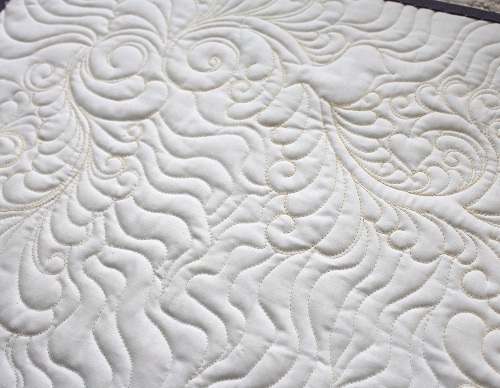 I am passionate about wholecloth quilting when it comes to machine quilting. However, I am keenly aware not all quilters want to do that kind of quilting — which is PERFECTLY okay!! I am not in any way getting on to you for not doing wholecloth quilting that oftentimes requires very dense background quilting. The background quilting you see in the following quilt images is quilted less than 1/8″ apart! Plus to be honest, that kind of dense background quilting probably is not conducive to be quilted on quilt tops made with printed fabrics. So, for a while now, I have been thinking about the matter of background fillers to go with feather quilting on “printed” quilt tops that are practical. One of these fillers is my Sand Dunes filler! 1. So, first, we have a feather plume “quilted” here. Click here to read about how I quilt my feathers. 2. After the feather is quilted, I picked a spot on the feather to just quilt something curvy, but somewhat graceful looking toward the outer edge of the quilt top. So you will notice I quilted my first Sand Dune pass (#1) beyond the edge of the quilt top INTO to the batting and quilt backing portion — assuming you baste your quilt sandwich with excess batting and quilt fabric around the quilt top, like I do. 3. 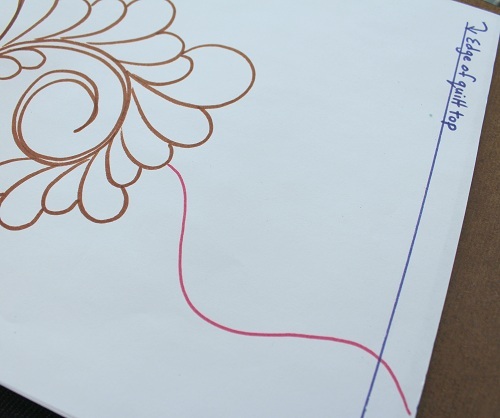 That’s because… it saved me having to cut my thread and restart on the pass back to the feather plume. Notice my pass back to the feather plume is only somewhat echoing the first pass. My Sand Dunes are meant to be “liberated” echoes in the sense that they are not exactly echoed. Another thing is that the Sand Dune passes are quilted far apart, unlike the 1/8″ or less distance in between echoes in my wholecloth quilting. Once the back pass (#2) touches the feather plume, I would then follow the quilt feather plume outline for just a little bit, and then, I would quilt toward the outer edge of the quilt top with another Sand Dune pass (#3) and so forth to complete the background quilting around the feather plume(s) on my quilt. This quilt back picture might show you exactly I meant. I like the Sand Dunes for a printed quilted tops because this filler looks open and doesn’t have a suffocating feel on the printed quilt tops. It is not demanding because it doesn’t require me to echo exactly, and veering off a bit on subsequent echoes actually adds to the overall textured look. I would love for you to try out Sand Dunes with your feathers — and let me know what you think. Meanwhile, if you haven’t checked out my other posts on machine quilting, feel free to do so by clicking here. I will be sharing with you some exciting machine quilting news in a couple of months – can’t wait!!! 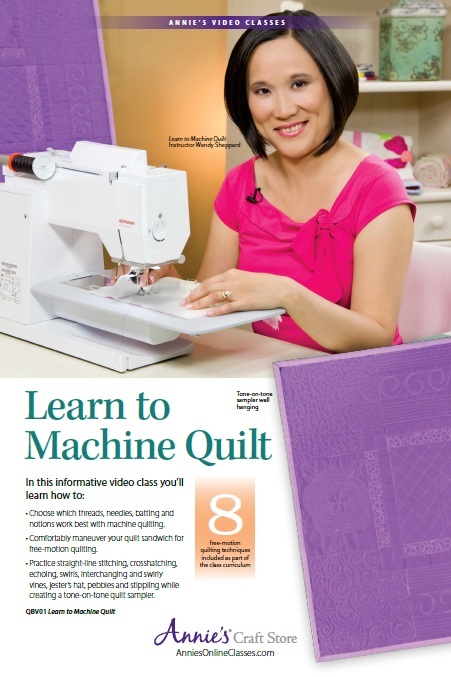 But for now, if you haven’t checked out my online Learn to Machine Quilt class (that covers practical motifs for beginning machine quilting) here, I hope you will do so as well. The class is also available on DVD here. Thank you for stopping by, Dear Friends! Blessings to you all! This entry was posted in "Scraps" Projects, Quilting, Thread Talk and tagged Background Quilting Tips, Domestic Machine Quilting, Feather Quilting Tips, Learn to Machine Quilt class, Machine Quilting, Wendy Sheppard. Bookmark the permalink. 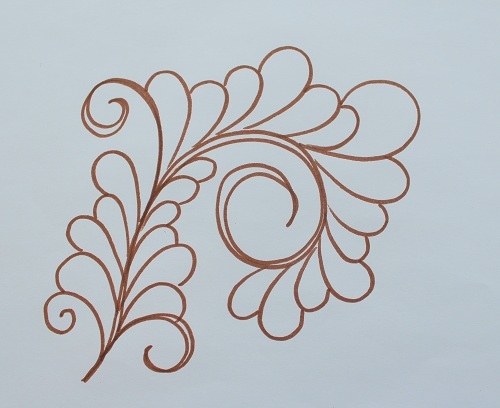 A wonderful ‘fill’ motif and so do-able for many skill levels!!!! I will be adding this to my feather/fmq series that seems to have taken off on Saturdays!!!! Love the casual feather approach, too!!!! 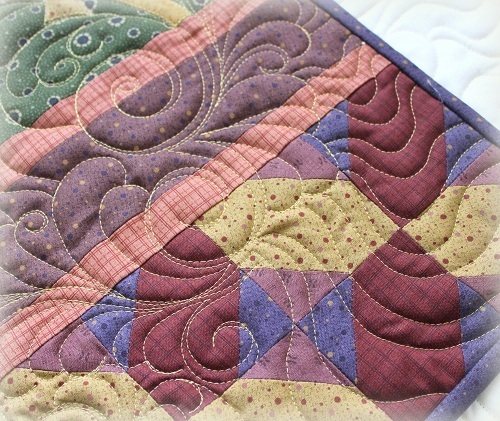 Whole cloth quilting is so dreamy…..sigh…………………..
You are pretty in pink Wendy! So YOU are one of those people who write books and make tutorials, and look just like a dress or sewing machine model. This quilting is very pretty. I really really need to get down to business. I am working on a few projects, and after that, I am going to set up my workhorse machine and practice every day! This looks so easy and fun. But of course, practice is the key. are you sickkkk of this snow and freezing frozen siberian like temperatures? Wow you are so talented. I’ve tried and failed to quilt. Excellent! 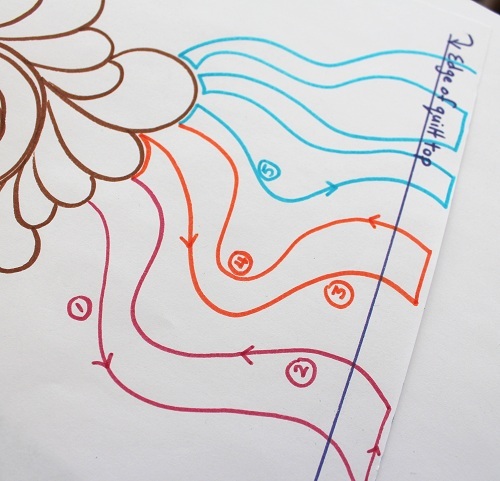 What a perfect idea for many quilts, or even around other designs, not just feathers. Love it! Thanks for the great explanation! Your quilting is awesome. Thanks for the “Sand Dune” tips. The “Dunes” really do set off the feathers in a very understated way but show up beautifully on the printed fabrics. A great combination. Thanks for sharing. Warm hugs for you!! I love your thread talk posts! Thanks for sharing your wonderful sand dunes filler. 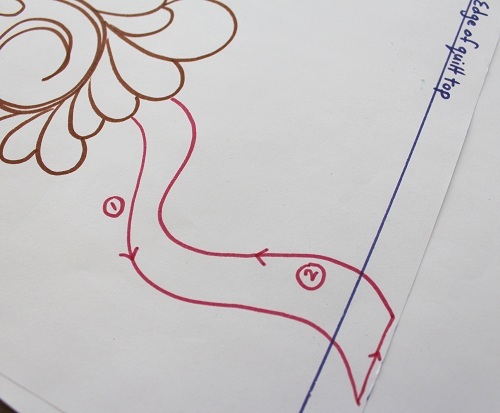 Luv this tutorial and wanted to print it to post beside my machine while i practice but none of the drawings in it printed only the text – why is this?? It looks great and thank you for going through the steps you use to create this look. I’ll have to give it a try. I just shared thispage on my Tumblr. Do you think your articles you post have really had any changes on the world? I believe they probably could. This article couldn’t be written any more clearly! Your website has a lot of conflicting points of view when compared to the other websites I have seen.